The WonderWorks building is hard to miss when you’re driving down the Parkway, as it is completely upside down! According to the official WonderWorks website, the attraction was once a top secret laboratory in the Bermuda triangle, but an experiment gone awry created a tornado that ripped the lab from its foundation and transported it to Pigeon Forge, TN. When you walk into the upside down WonderWorks building, you will go through a special inversion tunnel that sets things right side up. After you get your bearings, you can enjoy more than 100 hands on exhibits at this awesome indoor amusement park. The attraction is organized into six Wonder Zones that are themed around Natural Disasters, Physical Challenges, Light & Sound, Space Discovery, an Imagination Lab, and a Far Out Art Gallery. Guests can also enjoy an indoor ropes course, a laser tag battle, and even a magic show! Located in a giant medieval castle on the Parkway, MagiQuest is actually home to four different attractions. The signature MagiQuest adventure is a fun role playing game where guests use magic wands to cast spells, solve puzzles, fight dragons, and complete missions. Pirate Golf is a black light putt putt course set in a Caribbean pirate village. The Vault is a Mission Impossible-style laser challenge that kids absolutely love. Finally, Odyssey is the world’s largest mirror maze, a 5,000 sq ft. hallway with plenty of twists and turns. The great thing about visiting MagiQuest is that you can do as many or as few of the activities as you want. If you have an entire day to spend at the castle, we suggest taking advantage of their combo deal, so you can enjoy all four attractions for one low price. Visiting the Titanic Museum Attraction is one of the very best things to do in Pigeon Forge when it rains! This totally unique museum is actually shaped like the RMS Titanic, with the outside of the ship being a half scale recreation of the original oceanliner. Inside the museum, you will find full size recreations of rooms from the Titanic, including the breathtaking grand staircase. The architects who built the museum had access to the Titanic’s original blueprints, so every detail is historically accurate. The Titanic Museum is home to over 400 artifacts from the RMS Titanic, with the entire collection valued at $ 4 million! Guests at the museum will learn all about the history of the ship and will have the chance to steer the Titanic’s wheel, stick their hand in 28 degree salt water, and even touch a man made iceberg. When you stay with Large Cabin Rentals, you won’t even need to leave your home away from home to have fun. 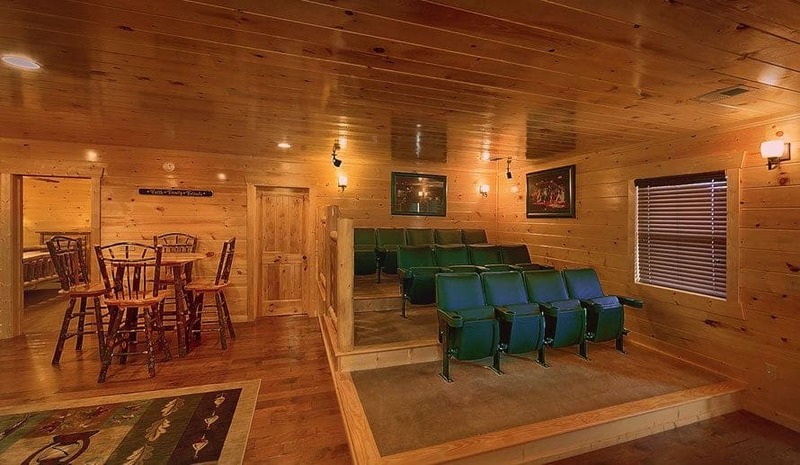 Our massive cabins are loaded with great entertainment, such as home theater rooms, game rooms, flat screen TVs, high speed wireless internet, and other wonderful things to do in Pigeon Forge when it rains. You can even rent a cabin with an indoor mini golf course or an indoor swimming pool! To start planning your vacation, browse our complete selection of large cabins in Pigeon Forge!